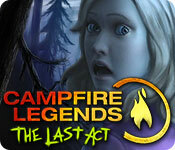 Campfire Legends: The Last Act is rated 3.6 out of 5 by 13. Rated 5 out of 5 by EzgiMelody from Incredible !! This game is Incredibly well-done game !! HOG.s and the other puzzel games are really great and challenging. Storyline is amazing and so sad also. Please... we want to see more games from this series. it was really so so good !! Rated 5 out of 5 by allisgr1 from allisgr1 loved it! I don't understand negative reviews . Come out with another one Please !! Rated 5 out of 5 by kerith90angel from BASED ON FULL GAME PLAY The first thing you have to realize about this game, it was made a while ago then released here. I've been playing these games for years so I loved it. I played all 3 in the series back in 2011; from start to finish. The Hookman has a spot that really scares you! It is rare I've ever been scared out of my chair but that one knocked me a few inches up in the seat!! In order to fully appreciate this installment you really should play the first 2 in the series (of 3#. I absolutely LOVED the graphics. This SE #which is offered as a Premium Edition )comes with a lot of bang for the buck. The screensaver was worth the purchase alone! It has an in game walkthrough guide, dl concept art and you can replay (the amazing) cut scenes. This game was made with quality and to this day, this series, remains high on my list of favorites!! Rated 5 out of 5 by Kimmycoo from mORE oF tHESE PLEASE! Totally loved this and the two previous games. This was the longest one of the others. Love the graphics and the puzzles are really fun! Some can be very challenging but you have the hint and skip system to help you out of any jam. I sure wish developers would make more games like this. I loved the story line, of Urban Legends, the campfire in the middle of the dark woods, a bunch a teens, a warm fire, hot cocoa, and ghost stories or rather Urban Legends. I love how all the games came together in this last one. Fantastic. One of the best series Ive played on Bigfish! Rated 4 out of 5 by charlene_lane from FIND OUT WHAT HAPPENED TO LISA This is the final game to the series which carries on from 'Campfires - The Baby Sitter' in which you play Lisa's younger sister. No-one knew what happened to Lisa, but you're about to find out. I was gobsmacked when I found out who it was that kidnapped Lisa and the rest of the girls and who was in league with The Hookman. There are voiceovers in the game and you get a diary later on to help Reggie and Ashley find out what happened to Lisa and to get clues on what to do. 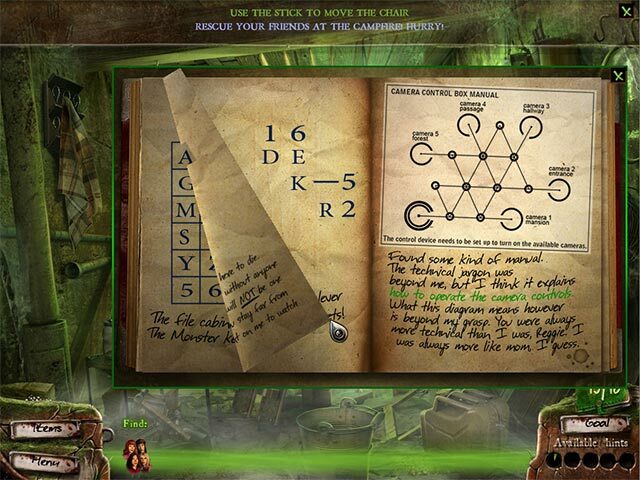 Its easy to read and you are finding pages as you go through the game. The graphics at the beginning are kind of gritty and dark, but you get used to it. Not all of the game is like that though. Sound is good and the music is creepy. 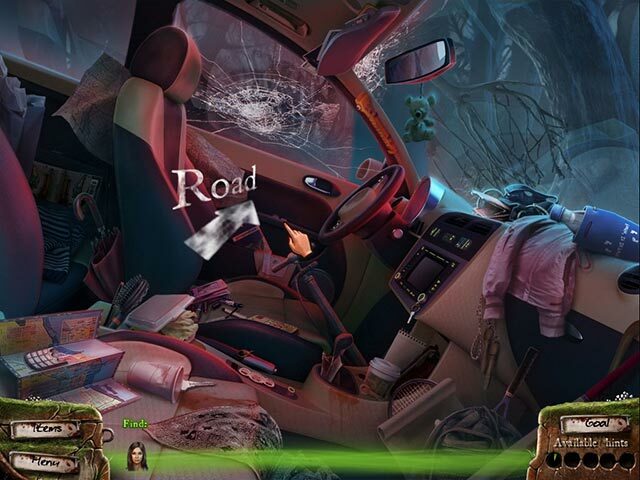 There are no hidden object games here, but there are plenty of mini-games which are very challenging and will take a while to do. You do have the option to skip any of them though if they are just too challenging or you want to move on. I didn't skip any but some did take me ages to do. You collect little bugs along the way to help you if you get stuck. These are scattered around and you can collect up to 5 at a time. I must admit I did use them a couple of times when I just couldn't find something. Some of the items to find are very small or well hidden, so these do come in handy. 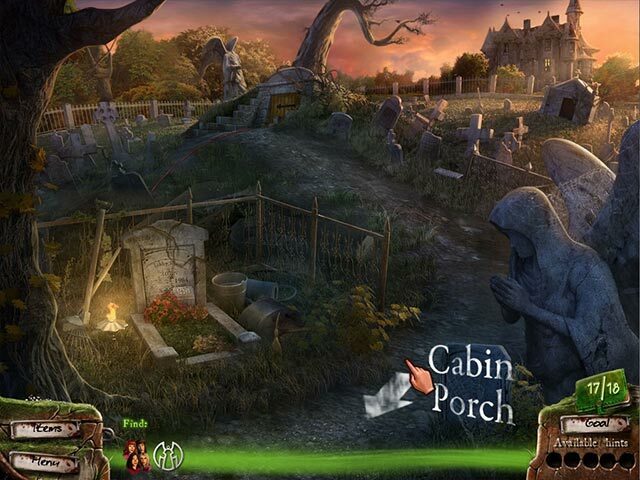 When you have finished the game you can play Project Stillwater which is to find 15 differences in each scene BY TORCHLIGHT. You have 5 minutes to do each scene. There are also bug hints in there as well to help you if time is getting short. When you have successfully finished one, then you can carry on with the next one and so on. I thought I was good at spotting the differences, but I only managed to find 3 in the first game in 5 minutes!!! Yikes they are hard to do. I think I'm going to be a while on those ones. All up the main game took me about 6 hours to do. Its a very challenging game with difficult puzzles, but I really enjoyed it. So if you love a good challenge, then this game is for you too. Happy playing fishies. Rated 3 out of 5 by ninda2 from I give it an ok... This isn't the worst game I've played and I didn't want to say I totally didn't like it, it just wasn't for me. I always suggest playing the demo before buying! Rated 3 out of 5 by FishyFemale from The story may get more interesting after the slow demo This is the third part of the Campfire Legends trilogy and supposedly continues the story that left off from the second installment. Since I've only played the demoes of each game, I don't know how well the story is fleshed out in each one, but the beginning of this one started out very cleverly using a major plot point from the second game's demo concerning hot chocolate. There's a strategy guide included and I discovered that I'd gotten through the first third of the guide at the end of the hour demo, so this appears to be a short game. I hadn't noticed if there's a guide included in the first two installments but walkthroughs are easily found elsewhere on the internet. The demo didn't pull me in quite as much as the last game in this series so I'll pass on this one. Items were harder to find because all the scenes were in the dark, but the skip on the one puzzle in the demo didn't require accumulating multiple hints like the former games did. A diary appeared right before the demo ended which provides the back story. This may very well be a good game for those who like the different kind of gameplay it offers, so I can't decide whether to recommend it or not, but do try it out for yourself. Rated 2 out of 5 by egale from Too lame I got this game because of the reviews. No one mentioned that this was made in some kids dorm room, or perhaps in front of a campfire? That's what it plays like. There is only one game mode, the graphics are horrendous and whatever your searching for is extremely hard to find. You don't seem to ever really have an inventory, and you have to "earn" hints by finding fireflies, which are extremely hard to see. I managed to play for a few minutes, made it all the way to the mansion! (If you have played, you know that's not very far). Then I decided oh well, live and learn, it's only money.